Connects up to 3 PC's and 1 MHL enabled smart phone. Supports up to 1920x1200@60Hz, full HD 1080p display resolution. Easy Plug and Play setup. No software installation required. Made in Taiwan. Yee Haa! Great device and much better than I expected! Works great - and as described by the manufacturer. Now, if my HP Pavilion G7 with Radeon video didn't have a memory leak in the driver software - I wouldn't have any issues at all. At least the latest driver from AMD solved the every 10 minute swap between displays (I'm running the display on the laptop and a second 24 inch monitor and extending the display). Apparently, there's a bug in the Radeon driver software that causes random behavior exhibited by swapping the displays (if you've extended them). With the updated driver, it's now down to every 3 or 4 hours instead of every 10 minutes (which is still a major pain in the you know what, but it sure beats every 10 minutes). This works perfectly on my old trusty and reliable HP DV8000 (which is now 11 years old and still running like a champ). Works perfectly on my home built server too. What I truly liked about the USB ports on the face of this switch box is the ability to have a central memory location that is shared between computers for quick temporary storage. Others have mentioned you need to TURN OFF GREEN POWER saving features on your attached computers. THIS IS TRUE! If you don't disable the green feature (allowing things like the display to go to sleep if not in use) you'll run into all sorts of trouble with KVM switches (all of them, not just this one). If the video hardware runs active all the time, when you swap between computers, the display hardware is active and doesn't have to WAKE UP to launch the user interface. This allows near instantaneous switching between computers. If you run your USB ports active all the time, you can hot swap the memory between computers (I have a 32G thumb drive that I have plugged into one of the extra USB ports and it hot swaps in about 2 to 3 seconds between computers (sometimes a little longer if there are a lot of extra drives attached on other USB ports of that computer - since it has to resolve everything in the drive list if you have File Manager/File Explorer up and running on that computer when you swap out to it)). To put it bluntly - this is a great device and has saved me a bundle of headaches by allowing me to have one central monitor and the ability to extend the display to the active laptop computer I have on my desk. I DO recommend plugging this animal in to a wall socket since it will make a big difference in keeping any thumb drive active and discoverable between switching events. Oh yeah, I'm running Windows 10, Windows XP, and Windows Server 2012 Enterprise Edition. So, no real issues on any of those operating systems (unless Windows 10 is what is causing my Radeon video hardware to act weird). It turns out this is the only 4 port USB 3.0 KVM/switch out there. What I liked: Setup - very fast. Switching - very fast. Would be great to have an audible tone - be the visual cue and switch is almost instantaneous -- which I like. 4 port switch -- 3 with USB 3.0 / HDMI -- last port for HDMI ---- so why only include only 2 (two) USB 3.0 cables and 2 (two) HDMI cables? USB3 and HDMI are why I bought this. Tried the 4 port iogear HDMI unit. The buttons were hard to push and even after the numerous mode changes that are suggested I still had problems with USB devices being detected and HDMI dropouts. This one on the other hand has been rock stable. 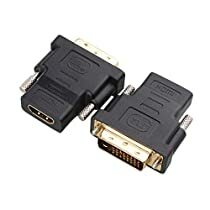 Had an issue at first with my super cheap display port to HDMI cables being fussy. Switching to straight HDMI cables did the trick. No USB fussiness either. Devices run at full USB3 speeds. Switches audio without complaint as well. A KVM should be a "set and forget" type device. That's what this is. It does what it does and it does it well.